There may be more method behind Donald Trump’s madness than people think, writes energy expert and author Michael Klare. His attempts to forge alliances with Russia and Saudi Arabia show that Trump is laying the foundations for a new world order, in which fossil-fuel powers will contend for supremacy with post-carbon, green-energy states. If we let him get his way, warns Klare, the world may soon be divided into two camps: the carbonites versus the post-carbon greens. Courtesy TomDispatch. That Donald Trump is a grand disruptor when it comes to international affairs is now a commonplace observation in the establishment media. By snubbing NATO and withdrawing from the Paris climate agreement, we’ve been told, President Trump is dismantling the liberal world order created by Franklin D. Roosevelt at the end of World War II. “Present at the Destruction” is the way Foreign Affairs magazine, the flagship publication of the Council on Foreign Relations, put it on its latest cover. Similar headlines can be found on the editorial pages of the New York Times and the Washington Post. But these prophecies of impending global disorder miss a crucial point: in his own quixotic way, Donald Trump is not only trying to obliterate the existing world order, but also attempting to lay the foundations for a new one, a world in which fossil-fuel powers will contend for supremacy with post-carbon, green-energy states. As noted in Foreign Affairs, this is a very different perception of the international system than that of the Wilsonian internationalists, who still see a world divided between liberal democracies (led by the U.S. and its European allies) and illiberal autocracies (led today by Vladimir Putin’s Russia). Surprisingly, it is no less distinct from the disjointed global system portrayed by disciples of the late Harvard political scientist Samuel Huntington, author of The Clash of Civilizations, who portrayed a world divided along “civilizational” lines principally distinguished by a clash between Islam and the Judeo-Christian West. Trump clearly has no patience with the first of these models and while he’s certainly exploited anti-Islamic sentiment during the election campaign and in his first months in office, he does not appear wedded to the Huntington thesis either. His loyalty seems to be reserved solely for states that produce fossil fuels, while his disdain is largely directed at countries that favor green energy. How you view the world — which of these visions you embrace — truly matters when it comes to shaping American foreign policy. If you favor a Wilsonian view (as do most American diplomats), your primary objective will be to bolster ties with Great Britain, France, Germany, and other like-minded democracies while seeking to limit the influence of illiberal autocracies like Russia, Turkey, and China. If you uphold a Huntingtonian outlook (as do many of Trump’s followers, advisers, and appointees), your goal will be to resist the spread of Islamist movements, whether they are backed by Shiite-majority Iran or Sunni-majority Saudi Arabia. But if, like Trump, your view of the world is largely governed by energy preferences, none of these other considerations matter; instead, you will lend your support to nations that embrace fossil fuels and punish those that favor the alternatives. “We are not here to lecture,” Trump insisted. “We are not here to tell other people how to live, what to do, who to be, or how to worship. Instead, we are here to offer partnership.” As part of this “partnership,” he signed a $110 billion arms sales agreement with the Saudis. Expected additional sales over the coming decade could bring the total to $350 billion. Many of these arms, once delivered, will be used by the Saudis in their brutal air campaign against rebel factions in Yemen. The Saudis claim the rebels (mostly Houthis from the country’s barren north) are receiving weapons from Iran, thereby justifying their own attacks, but most observers agree that such Iranian aid is limited at best. In the meantime, the Saudi strikes are taking a heavy toll on civilians and helping to create a humanitarian crisis that has contributed to a severe outbreak of cholera and threatens famine on a massive scale. Step two in this process was the enfeeblement of the NATO alliance and the European Union (EU) — most of whose members are strong supporters of the Paris climate agreement — and the improvement of U.S. relations with Russia, the world’s number two oil producer. So far, President Trump has been unable to make much progress on the second of these goals, thanks to the ongoing uproar in Washington over allegations of Russian meddling in the 2016 presidential election, but he achieved spectacular success in the first during his May 25th visit to NATO headquarters in Brussels. He even crossed up his own advisers by switching speeches at the last moment and refusing to commit himself to NATO’s mutual defense agreement. He refused to reassure its members of Washington’s commitment to the “one-for-all, all-for-one” principle embedded in Article 5 of the NATO Treaty, obliging all member states to come to the aid of any member under attack (although he would later made an explicit commitment to that article during a White House press conference). In addition, he hectored them about their failure to devote adequate resources to the common defense. Other American presidents have offered similar complaints, but never in such a disdainful and dismissive manner, guaranteed to alienate key allies. On top of this, he appeared to differ with senior NATO officials over the threat posed to the alliance’s solidarity by Russian cyber attacks and political meddling, downplaying their significance. Step three was President Trump’s formal announcement of a U.S. withdrawal from the Paris agreement in a Rose Garden ceremony on his return to the White House. As it currently stands, that agreement would require significant reductions in U.S. emissions of carbon dioxide and other greenhouse gases (GHGs), principally through curbs on the combustion of fossil fuels. To fulfill such obligations, President Obama pledged to constrain GHG emissions from electrical power generation through his Clean Power Plan that, if fully implemented, would have severely diminished the domestic use of coal. He also mandated improvements in the efficiency of petroleum-fueled vehicles. In repudiating the pact, Trump hopes, against all odds, to breathe new life into the domestic coal industry (currently suffering from intensified competition from natural gas, wind, and solar power) and reverse the trend toward more fuel-efficient cars and trucks, thereby increasing the demand for oil. In addition, each of the three is closely linked to other major oil and gas producers: in the case of the U.S., Canada; for Saudi Arabia, the Persian Gulf sheikhdoms (including tiny Qatar with its giant natural gas fields which, at this very moment, the Saudi royals are trying in a draconian fashion to dominate and subjugate); and for Russia, the former Soviet republics of Central Asia. All of this only adds heft to the hydrocarbon dominance of this potential trilateral alliance. When oil and gas output from all of these countries, including Azerbaijan, Kazakhstan, Kuwait, Oman, Qatar, Turkmenistan, and the United Arab Emirates, is added to that of the Big Three, the resulting combine controls approximately 57% of world oil output and 59% of its natural gas production. Given that petroleum is still the world’s most valuable trade commodity and that oil and gas together account for 60% of the world’s combined energy supply, this represents a stupendous concentration of economic and geopolitical power. It is still early days, but the outlines of a potential new global order seem to be emerging, with the fossil-fuel states battling to preserve their dominance in an era in which an ever-increasing share of the world’s population is clearly going to embrace green energy technology (and the massive job-creation machine that will go with it). The events of just the first few months of Donald Trump’s presidency already give us ample food for thought on the emergence of a new bipolar energy planet, including a willful attempt to cripple NATO; a so-far-abortive effort to forge a U.S.-Russian alliance; Washington’s embrace of Saudi regional hegemony; and the emergence of a possible Chinese-German alliance. Keep your eyes open for further developments along these lines. A world dominated by green powers, on the other hand, is likely to be less ravaged by war and the depredations of extreme climate change as renewable energy becomes more affordable and available to all. Those, like Trump, who prefer an oil-drenched planet will fight to achieve their hellish vision, while those committed to a green future will work to reach and even exceed the goals of the Paris agreement. Even within the United States, an impressive lineup of cities, states, and corporations (including Apple, Google, Tesla, Target, eBay, Adidas, Facebook, and Nike) have banded together, in an effort dubbed “We Are Still In,” to implement America’s commitment to the climate accord independently of what Washington says or does. The choice is ours: allow the dystopian vision of Donald Trump to prevail or join with those seeking a decent future for this and future generations. Michael T. Klare, is a professor of peace and world security studies at Hampshire College and the author, most recently, of The Race for What’s Left. A documentary movie version of his book Blood and Oil is available from the Media Education Foundation. Follow him on Twitter at @mklare1. This article was first published by Tomdispatch.com and is republished here with permission. The article ascribes to Trump the ability to think strategically. I’m not convinced he is able to do that. Oil n gas needs a willing seller and a willing buyer – this is going to be a growing problem (as coal has discovered) – with fewer and fewer willing buyers. Trumpy may thus find that he has loads of the stuff – but it will be like being stuck in the middle of the desert – trying to sell……… sand. There is no, zero, evidence that Trump has the ability to think strategically. Trump blunders through life, changing his mind, sometimes in a single paragraph. If someone who Trump trusts (at the moment) suggests an action then Trump is all for it. If that person falls out of favor later in the day Trump mounts a new horse. People need to understand that Trump is not a successful businessman as he is often portrayed. Trump is someone who inherited a fortune and has poorly managed that fortune. Someone took the value of Trump’s inheritance and used stock market history to show that had Trump put the money into an index stock fund he would have a much higher net worth now. Trump has underperformed the stock market. That is not a sign of success. What Trump is is a dangerous loose cannon, disastrously careening around the deck as the ship pitches and rolls in the waves. It’s being reported that the Secretary of State and Secretary of Defense are now ignoring Trump and setting their own policies when it comes to relations with other countries. Apparently they have decided that the US cannot afford the damage to international relations that would ensue if Trump’s decisions were followed. I was saying myself, these are interesting times when Rex Tillerson and Rick Perry were militating for staying in Paris. There are two major motivators in Trump’s world. 1) Undoing everything the hated Obama accomplished. Obama made fun of Trump and Trump’s philosophy is to hit back “five times harder”. 2) Gain as much praise and adoration as possible. Trump is busy dismantling Obama’s achievements. First thing the next president will have to do is to undo the mess Trump is creating and restore the good stuff Obama did. Trump is all buddy-buddy with some of the oil sheiks because they are talented liars and tell him what a wonderful person he is. Trump enjoyed his time in the Middle East because it’s a place where protesting is simply not allowed. Trump restricts who can get close enough for him to see or hear them. He “refreshes” himself by arranging rallies for his faithful followers. (But the last one failed to fill the arena.) He sequesters himself at his private properties, golf courses, where he can be in contact with only those who tell him what he wants to hear. Looking any deeper for reasons why Trump does what he does is a waste of time. Fossil fuels can mount a strong attempt to stay relevant but it’s all over for them. Coal is rapidly dying. Oil is very close to demand peak, within five years electric cars, trucks and buses will be lowering oil use. Natural gas will probably hang on the longest because it serves as a low cost fill-in for wind and solar. But NG’s future is fading as storage becomes cheaper. Coal has little to no political power in the US these days. Wind and solar are the revenue producers and job creators. US shale oil is probably done in terms of new wells. The cost of oil is very unlikely to rise high enough for long enough to send rigs back into the fields. Fossil fuels will make an attempt, but they’ve already lost. The truth is simple: the technology to end fossil fuels does not (yet) exist. Solar and wind will never be able to sustain our lifestyle. So Trumps’ decisions are right. In time nuclear only may end the fossil fuel era. But much research has to be done. Sorry, David. That is simply 100% incorrect. The globe is awash in solar and wind energy. There is more available energy that we could ever use in our wildest dreams. The cost of turning that energy into very affordable electricity is already being installed. We have the storage technology needed to make wind and solar electricity 24/365 reliable. This analysis divides the world into two camps using an imbalanced set of variables. The Energy Post article of January 18, 2017, “The geopolitics of energy: renewables are not in the race yet”, has confirmed the continuing subsidiary role of non-carbon sources in the global energy supply. I once calculated that the total solar capacity realized to date would be adequate for energizing only one year’s worldwide production of air conditioners. Renewable energies for power generation dominate particular new investments in a similar manner as electric automobiles. Both types of technologies liberate the owners from fossil fuel dependency, but at the price of higher capital costs and partially restricted availability. The purchasing decisions involved are therefore more significant as indicators of individual aspirations rather than of comprehensive reliability. Conventional technologies remain safety nets for whenever new technologies cannot meet the requirements of extenuated demand. A ten gallon canister of gasoline still provides extended-range mobility insurance surmounting a spare storage battery carried in the luggage compartment of an automobile. Despite high carbon dependency, Eastern European societies dependent on domestic coal and lignite cannot render the same contribution to global security as their western neighbors. To that extent, it is an incongruous premise that “like Trump” those nations will be supported that embrace fossil fuels, while those that favor the alternatives will be punished. Though I often disagree with Michael Klare, I usually find his arguments compelling and well-thought out. This piece is shrill and over the top. Some grand alliance between US-Russia-Saudi Arabian is conspiracy theorizing at its best. The US is still meeting its NATO obligations (much more than most members) and doing quite a bit behind the scenes to shore up our most vulnerable allies against Russian intimidation. 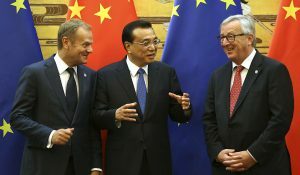 China is not about to take a global leadership role in anything (See this week’s Economist), let alone align itself in some sort of ‘green’ alliance with the EU. Also, using such phrases as “…oil-drenched planet …to achieve their hellish vision…” is amateurish at best. As noted in the comments above, market forces are already creating adjustments in the global hydrocarbon sector, despite what Trump, Putin or anyone else may want to achieve geo-politically. Ascribing to Trump any sense of strategy is unusual when most of the discussion is about his psychotic narcissism and possible dementia. However, unlikely as it seems, thank you reminding us that there may be method in his madness; and if so, that ‘method’ could be very dangerous. I think most of the comments make more sense than the article. Even if Trump can be credited with any form of strategic thinking, which on current form is unlikely, the argument against fossil fuel has already been won. Big business, whose long term plans see far longer into the future than political terms of office, already has seen the writing on the wall for fossil fuel. Divestment is a telling feature of pension funds and this will only increase no matter what Trump does – or tries to do. Many people appear to believe that the transition to renewable energies can be achieved simply by driving the fossil fuel companies into bankruptcy. Divestment advocacy rests on that mechanistic premise. The resulting multitudinous renewable energy services would soon become unmanageable, however, as illustrated by the expansive infrastructures of canal and railroad corporations in early industrialized England that ultimately fell into disuse or were nationalized. Many of today’s quaint restaurants are found in former water powered textile factories and country windmills that are located in close proximity to the flocks of sheep and fields of grain that they no longer serve. Renewable energies have not satisfied the fundamental need of heating large municipalities. 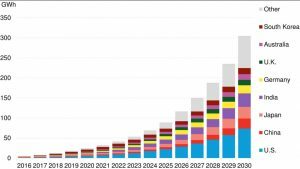 Rising cooling requirements may exceed this demand by 2050, therefore effectively doubling global energy needs merely to maintain tolerable temperatures for human habitation. Many costly mistakes may necessary to achieve only incremental progress along this path, with abandoned technologies sold for scrap like steam locomotives and belt-driven looms in the last century. That’s how it will happen. But the route will not necessarily be smooth. We can see economic disruption in the US as regions that lived off coal extraction are sinking into poverty. The same will happen for some of “oil country” except that many of those same areas have excellent wind resources. Insulation and heat pumps. Run a heat pump backwards and it’s an air conditioner. And heat pumps run off electricity. The new ones are very efficient. I can’t imagine how the collapse of coal would make wind and solar unmanageable. Nor the collapse of oil make EVs not run. (Based on US data) we now waste over 50% of our primary energy simply because fossil fuel plants/engines are so terribly inefficient. If we could replace fossil fuels with RE overnight in the US we would use only half the primary energy we now consume. Rising temperatures will switch energy use from winter to summer for building conditioning. Solar panels work well and will provide all the cheap electricity we can use in sunny weather. When Ford’s Model T became affordable and available in large enough numbers people like my grandfather pulled their horse drawn buggies into an open field and set them on fire. There was no used buggie market and the shed space was needed for their car. They raked through the ashes to recover any reusable metal bits…. Did you read Michael Klare’s article at all? He is aware that there is an energy transition going on, just as I am. That’s an essential part of his argument. It’s about whether some of the most powerful countries in the world, including the U.S., want to hold on to fossil fuels or not. Just because 365 companies and investors say they will invest in renewable energy does not mean the world will switch to renewables. Please try to understand that the global economy is based almost entirely on fossil fuels. There are very powerful interests that want to keep it that way. Mr Klare is warning us about that. I am not aware of an energy transition which is storage transition. Coal, oil, gas, uranium are energy storages, wind and solar is not. We are fooling ourselves on an unprecedented scale ! One storage technology is pump-up hydro which we have been using for over 100 years. There are more than 300 operating PuHS facilities around the world. And more are being built. Another is compressed air storage (CAES). CAES has not proven to be efficient enough for common use but there are efforts to make it more efficient. Flywheel storage is playing a small role on grids, basically for grid smoothing. 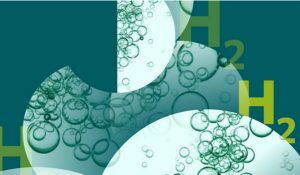 Hydrogen may play a small role, but hydrogen is a very inefficient way to store energy. And has it’s special storage problems. Coming on fast are batteries. Both chemical and flow batteries. Batteries are now replacing gas peakers for grid smoothing (absorbing supply peaks and supplying demand peaks). We’re also seeing batteries installed for grid storage. That includes batteries being installed at wind and solar farms which then turn wind and solar into dispatchable generators. As battery prices continue to fall (and they are falling rapidly) batteries will play a larger and larger role on grids. But PuHS is now and for the foreseeable future our least expensive long term storage solution. People invested in fossil fuels and earning their living from fossil fuel companies want us to keep using fossil fuels. But they, at most, will slow down the transition a bit. We’ve seen that in the US as FF interests have attempted to create legislation blocking/limiting RE but have failed. The US coal industry has shrunk so much that it has little remaining political power. Wind and solar are now more powerful in terms of the revenues they produce in states and the number of jobs they create. Bankrupt coal mines have no money to contribute to election campaigns (or to bribe officials in countries where bribery is part of the system). EVs will soon be cheaper to purchase than same-feature ICEVs. The oil industry will not be able to control what people purchase when they buy a new car. Oil will not stop municipalities from switching to battery powered buses, garbage trucks and vehicle fleets. Nor to stop trucking companies from moving to battery powered long range transport trucks. Oil demand will drop very rapidly to a small percentage of what it is now over a ten to twenty year period. The US, Europe and China (along with a few other countries) will switch rapidly. And that will cause other countries to change as well. People in developing countries aren’t going to want to pay more than they have to for electricity so they will switch to RE. And they will want to spend as little for transportation as possible, so that will mean EVs, not ICEVs. I took a look at the article. Bit of a mixed bag. Wind is on a “bigger is better” trajectory although I’m not sure how long this can be sustained. In the case of PV, the article is dead wrong. It is a silicon tech and R&D shows that efficiencies north of 35% are economically possible. With respect to liquid or gaseous fuels – a large amount of R&D on catalysts is starting to produce a result. 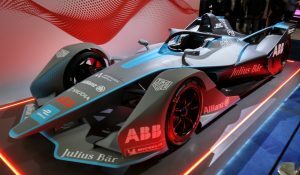 Electric vehicles are showing a fibonnacci series growth – 250m by 2026. Probably mostly in US, China & Europe. Mr Michel mentioned the railways of England. Let’s try this for a statistic: The UK installed using mostly human muscle 6,600 miles of track (and stations) in 22 years. So things can change very quickly. Yes RES energy accounts for a small amount of global energy – now. What is important is how it looks in 10 or 20 years. I believe that the change will be non-linear. Everything is possible if you respect the two principles of the Thermodynamic. But not everything is making economic sense. Therefore, whatever the dream of the dreamer, the market will ultimately decide, except if we prefer a communist system where the elite will decide. For time being with just 2 % it will be difficult to believe that in -say – 10 years thing will change a lot. In 1988 wind and solar contributed 0% of US electricity. In 2008 wind/solar passed the 1% threshold. In 2010 wind/solar passed the 2% threshold. In 2013 wind/solar passed the 4% threshold. In 2017 wind/solar will pass the 8% threshold. Starting in 2010 we’re seeing a ~ four year doubling after a two year doubling. The rate of doubling will probably slow as we reach a somewhat steady, but high, rate of installation. That’s now technology transformations tend to happen. Electricity is just 20% of our energy consumption. The overwhelming majority of our energy needs is filled by fossil fuels. This will be the case for a long time to come unless active measures are taken, e.g. to raise carbon prices. We can generate all the electricity we could ever use from wind and solar and not make even a small dent in the amount of energy resources available. And we can make that electricity very affordably. So, task one. Find ways to do as much as possible with electricity. Building heating – electric heat pumps. Ground transportation – electric cars, buses, electrified rail. Flight – harder buy the Hyperloop may be a replacement for well over 50% of all flying. Battery powered flight is at least theoretically possible. Process heat for industry. I don’t know if it would be possible to use resistance heating or not. It is not a topic I have seen covered. But we do use electricity to smelt metals, so possibly. Do remember, when you talk about fossil fuels you are talking about primary energy. And (using US numbers) almost 70% of all primary energy is lost in the form of waste heat. In fact, if you take away the primary energy that enters the system in the form of electricity from RE and nuclear the percentage of wasted energy rises much higher than 70%. Look closely at transportation. 27.9 quads of energy go in. Only 5.86 do any useful work. 22 quads just “go up in smoke”. That’s just under 80% (78.9%) of a massive amount of energy that is wasted. EVs waste about 20%. There’s roughly a 10% loss when charging batteries and another 10% loss in friction heat in the motor/drivetrain. So for 100 units of fossil fuel transportation energy we use we need to generate only 25 units of electricity from renewable sources. Look up at electricity. 37.5 quads. 13 from coal and 10.3 from NG. Coal plants are, at best, about 40% efficient. We can replace 100 units of coal with 40 units of renewable electricity. CCNG plants are about 60% efficient so replacing 100 units of NG would take only 60 units of RE. 83% of our petroleum use goes to transportation. We can electrify most of our transportation. 100% of our coal goes to electricity. We can replace that with RE. 36% of our NG goes to electricity. Substitute renewable electricity. Some goes to residential use – heating and cooking. Both replaceable with RE. We’d have to dig deeper into the numbers to see how much of the commercial and industrial use of NG can be replaced with electricity but that’s well under half of our NG. At this point wind and solar are cheaper than coal, petroleum and natural gas used for electricity generation. And they will only get cheaper. Economics will drive the planet to renewable energy mainly in the form of electricity. A carbon price would be not a cause for the transition, but it could be a very welcomed catalyst. The faster we drive the move away from fossil fuels, the less our extreme climate change hurt will be. Electrify all our transport and heating and supply all that electricity with wind and solar power? Is that your idea? I have not seen any serious study that believes this is possible physically or economically. You are a believer. I will let you be with your beliefs. EVs are already cheaper to operate than gas or diesel powered cars. Within five years the purchase price for an EV should be at or below that of a same-feature ICEV. Battery powered buses, delivery vans and garbage trucks are already at work in cities. They save cities money. Europe already runs electrified rail. You don’t need a study to tell you that transportation (aside from flight) is already electricity ready. Modern heat pumps are very efficient. Cheaper to operate than gas or oil heaters. Why do you need a study when these are simple facts that should be obvious to anyone who opens their eyes? You’re running an energy blog. You should know this stuff as a matter of course. The US is addicted to liquid fuels for transportation. Light passenger vehicles might switch to EVs over a few decades so reducing fossil fuel consumption. But in the US trucks, trains and planes which use not much less fossil fuel than cars overall will run on distillate fuels for the foreseeable future. The energy density of liquid fuels being far superior to batteries in high power applications. BTW those city buses and short journey vehicles are immaterial and many are hybrids anyway. Tesla is introducing a battery powered 18-wheeler tractor later this year. There are already battery powered buses in use. Some of our rail is electrified. The rest can be. Planes are the last unsolved problem. Overhead lines can power Trains, as well as they can power trucks, batttery hybrid trucks – battery+overhead line. Not a real cost problem, since that solution is cheaper for logistic operators than diesel powered trucks. zero technical poroblem. A political problem. Someone has to decide on large scale einvestment to remove the hen and egg problem. And that’s not the only possible solution, it’s just one which works, as example. Karel, Fraunhofer is not a serious source for you? I was just some time ago in meetings with Fraunhofer ISI partly on this topic. German energiwende, path for 95% CO2 reduction does exactly this. But maybe coming from germany it may not be considered serious. @H.Frik The trend is toward coordless equipment. So in the future overhead lines may be eliminated as trains are powered by compact (fusion) reactors. Grids will disappear if every city has it’s own (nuclear) reactors. Land is saved for nature. This is real progress. Anything else is not. Offshore wind turbines are now approaching 10 MW in nameplate capacity ( Vestas V164 at 9 MW). There is a 50 MW turbine being designed/developed (Lockheed Martin). And some in between 10 and 50. Cars basically replaced horses for transportation in 20 years in the US. Things move much faster these days. The transition off fossil fuels will have two, possibly three drivers. Market forces will cause the switch simply because renewable energy and electric transportation are cheaper. We’re now seeing thermal plants close because they cannot compete in the lower priced wholesale market. People will push for the move off fossil fuels because of climate change. And this includes people running utility companies and other businesses. Even if the savings are marginal there will be a desire to move off fossil fuels by many/most of the people working in those organizations. Especially as the old deniers retire/die. And health improvements may be a third driver as countries clean up their air and cities ban first diesel and later gasoline powered vehicles. China is pushing hard to reduce coal use and vehicle exhaust in cities. India is getting started. Some European cities are already talking about banning diesels. Three forces pushing a change will accelerate the change more rapidly. Solar and wind have been demonstrated to produce electricity less expensively than do fossil fuels. We didn’t need to wipe out smallpox in order to know that the smallpox vaccine worked. That claim has just been clearly demonstrated to be incorrect. The fact that in some places solar and wind are cost-competitive with fossil fuels does not mean it’s the case everywhere nor that solar and wind can be scaled up sufficiently to supply the energy needs of the world. In fact, if you really care about advancing clean energy, your assumption is dangerous. It implies that the transition to a low-carbon economy will happen “automatically”, for economic reasons, by market actors. This seems to me a delusion. Have you not been following the cost of hardware for wind and solar? The only places where wind and solar are not inexpensive to install are those places which have yet to build up their installation infrastructure. Installation is cheap in high labor cost markets like the US, Germany and Australia. Where can some combination of wind, solar, hydro, and geothermal not power the regional grid? Specific places, please. It’s happening “automatically”. Market forces and the desire for cleaner air are driving the transition. Look around. That said, we need to press harder on the accelerator. Market forces may not drive the banishment of fossil fuels as fast as we need. You are shifting the burden of proof to me but you have not demonstrated what “the cost of hardware for wind and solar” is. And indeed, you are ignoring the software, it seems, i.e. the system costs. A couple of auction prices in Abu Dhabi and Chili do not translate into overall cost competitiveness. If you look for places, look no further than the Netherlands, where I live and where we have no hydro or geothermal, solar will be limited due to lack of sunshine and wind due to lack of space. If we leave things to the market, we will not have a clean energy transformation in my country, I can assure you. In addition, you are ignoring that vested interests are huge and will fight back, as Klare is at labour to point out. In vain it seems. (Some people seem unable to distinguish anymore what is written from what they in their minds think that is being written.) We are on the same page when it comes to the need for an energy transformation but you are way to casual about it. No, I am asking you if you have followed the hardware cost of wind and solar. Last time I looked if you look west from your country you look out into the very windy Atlantic. If you don’t want to live with wind turbines on your farms (turbines take very little actual real estate) then plop them down in the ocean. It looks like Holland imported 35% of its energy in 2016. Drop an extension cord down to Portugal and Spain for some of their abundant solar resources. If fossil fuel interests are strong in Holland then fight them. That’s what is happening in other countries. The transition is not finished by any means, it’s only getting started. Fossil fuel (and nuclear) interests are fighting back but the most they’ve been able to do is to delay a bit. But over time they will have a harder and harder time opposing because with each new wind or solar farm the fossil fuel industry loses power. So are you now trying to say cost of offshore wind are also competitive with coal and gas? Offshore wind that has to come from the Atlantic? And “drop an extension cord down to Portugal” you think will get us – what exactly? Solar power from Portugal? To fill our energy needs? I can ‘t take this seriously anymore. First, how much does coal-electricity actually cost you in Holland? Please include the external cost. “Coal-fired power stations cost the European Union up to €42.8 billion a year in health costs associated with coal-fired power stations. ‘The Unpaid Health Bill: How coal power plants make us sick’ — found that EU-wide impacts amount to more than 18,200 premature deaths, about 8,500 new cases of chronic bronchitis, and over four million lost working days each year. The total costs are up to €54.7 billion annually when emissions from coal power plants in Croatia, Serbia and Turkey are included. What does it cost Holland to generate electricity with gas? What is likely to happen to the price of gas over time? Now, let’s look where offshore wind prices are today. “EnBW will develop the 900MW He Dreiht site in the North Sea without federal support, meaning the project will only receive the market price for electricity. I believe German wholesale prices are lower than Holland’s. Correct? Solar. A 800 mile (1,200 km) HVDC line would hook Holland up to sunny parts of Spain or Italy. Since 1970 we have been using the Pacific Intertie, a high voltage direct current (HVDC) transmission line that is 846 miles (1,362 km) to move electricity from the Pacific Northwest to Southern California. This is old tech, you’ve got lots of HVDC in Europe as well. With transmission you can import solar from the sunny parts of Europe. And you can sell wind-electricity south during the night. Bob, northern Europe needs firm dispatchable generating plant. Our weather pattern is not so good for renewables as the US southern states. 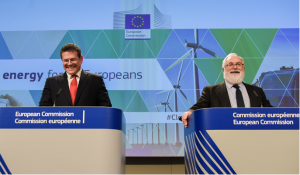 Your blue sky renewables only ideas are far too risky for Europe and likely to be far more costly than you are prepared to admit, and sounds impractical too. California can press ahead and phase out reliable generation in favour of intemittent ones. Most of Europe will watch to see how you get on so we don’t make the same mistakes…….although Germany is a good showcase already of how not to run an energy supply system. Regarding the cost of offshore wind power: are you aware of the latest auction results in the Netherlands and Denmark? Bob wrote that the wind comes from the Atlantic not that the turbines should be in the Atlantic. The extension cord to Portugal is of course a poetic way of saying that the power market should work on a European scale, rather than to strive for “power independence” for each country separately. A further physical and economical integration of power markets is also an EU goal, not so much for the benefit of renewables, but for economical, political and energy security reasons. So “extensions cords” will be built with or without renewables. Guess what? I’m the editor of this website. Search “offshore wind” and see what we have published about it. I know costs are coming down, especially near offshore, but they are not on a par with coal or gas fired power yet, let alone if you build them in the Atlantic Ocean with extension cords from Portugal to the Netherlands (poetry doesn’t enter into it). You are losing sight of what the discussion is about, namely Michael Klare’s article. I am in favour of offshore wind and it will make a difference but it won’t be able to stop Trump, Saudi Arabia and Russia, if no other actions are taken. This is the last contribution of me to this discussion. Thank you. Germany wholesale electricity prices in 2016 averaged 34.2/MWh. The recently bid offshore wind farms for Germany are willing to sell at wholesale market rates. That brings German offshore wind below coal and natural gas. I know Germany isn’t the Netherlands, but it’s next door. I did find some data stating that the wholesale electricity price in the Netherlands was very similar to that of Germany in 2016. Perhaps someone has better coal and gas generation prices for the Netherlands? I am fully aware of your status on this site, and there have been articles on energy post about the auctions. The remark about the auctions was a rhetorical one. Regarding the ocean offshore I was a bit quick to shoot from the hip. Bob did write the turbines should be put one the ocean. However we still got quite a lot of usable continental shelf available so there is no short term or middle term need to go to the Atlantic. That “extension cords” would have been build anyhow is quite relevant. It means not all their cost should be attributed to renewables. Take the Norned HVDC cable. In practice it has mainly served to store coal baseload power. At night the Dutch baseload plants sold their power to Norway, during the day the utilities bought back Norwegian hydropower. Yet nobody has argued the cost of Norned should be added to the cost of Dutch coal power plants. The relevance of the Discussion of the European situation is the question if climate action and the growth of renewables will go on outside the US during the time that Trump is stalling the energy transition. Bob/Hans, those recent German offshore wind farm contracts are low in price because the sites are permitted, they are not deep water and the transmission connection cost is socialised. Furthermore, the investors are not yet committed. They have only taken an option to build because the technology needed is not yet available. So cost comparisons based on these projects are misleading. Germany is now controlling the rate at which new wind capacity is built as the free for all has caused so many problems. That means developers now have to bid and win a contract to build large projects. Developers will be watching wholesale prices closely too before they press ahead. No point in investing in projects wholly exposed to wholesale prices if they are likely to be depressed for years by over capacity. Indeed that is becoming a significant issue for investors financing new renewables. 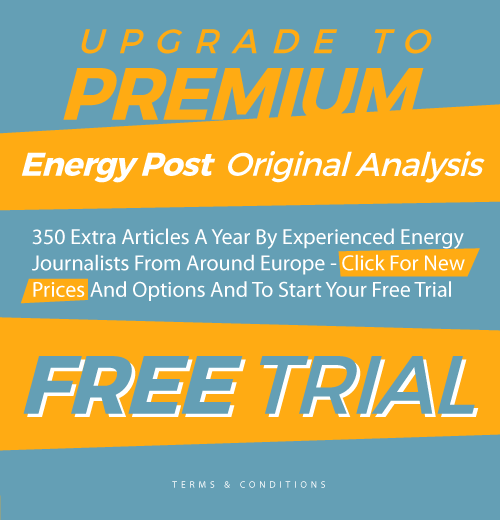 In any over supplied market investing in new capacity is a very risky business – unless they are subsidised and the era of subsidised wind power seems to be over. Nigel, the cost of solar, onshore wind, offshore wind, and storage are rapidly dropping. We are not seeing any significant cost drops in other ways of generating electricity as far as I can tell. Nor do we have a proven route to bring down prices for any of those technologies. Prices for some alternatives are, in fact, rising. What we are seeing is something like we saw with the drop in computing power. As we see new low prices announced that tells us that we have not yet reached the price floor. New low prices are indicators of where prices, in general, are heading. Keep that in mind when you question the role renewable energy will play in our future. Cheap, as long as it is low carbon, will win out. Nigel, it is not just the German auctions. Dutch and Danish auctions also resulted in surprisingly low bids. The main reason the German bids ended so low is the windparsk have to be ready only in 2024, meaning Dong could speculate on further technological developments. If you start complaining about socialized costs you should also consider things like free insurance nuclear power plants get from governments and the external costs of pollution of coal power plants. Hans, if I lived in Germany I wouldn’t be at all happy about a $16bn transmission project that Tennet has to build to move wind generated power to where it is needed in the south of Germany. Clearly the generation should be close to demand centres to avoid excessive grid reinforcement costs. The EEG support element of a domestic bill may be levelling out, but the Grid charge element will be increasing steeply so continuing to push up German domestic prices. @ nigen, the north south interconnetors in germany ar not just conection cables to bring wind power to the grid, they also transport photovotaic from germany’s south to the north. And scandinavian hydropower to italy, and italian solar power to scandinavia. Or Austrian hydropower to UK. Or UK windpower to storage in swizerland. I could extend this list endlessly. So compared to it’s mulitple uses, it costs just a apple and a egg, although nominal costs are high due to underground cabeling. Nigel, I live in Germany. ANd I am not happy about Lignite plants polluting the atmosphere and killing citizens with their fine dust ouput. I am not happy for nuclear power plants getting free insurance from the government and not paying enough for cleaning up after themselves. Regarding the investment sum of Tennet for offshore girds it seems you are doing a bait and switch. 16 billion is the amount of total grid investment in the Dutch and German grid by Tennet. £16bn is the estimated cost of the Suedlink that Tennet is having to build to deal with an uncontrolled expansion of renewables in northern Germany. All new nuclear plants now have to fully fund their future decommissioning costs so that’s no longer a good anti argument. @ Nigel: The highest cost estimate I could find in the German press is €10 billion ( 8.8 BP). So it seems something was added in translation. Without renewables the link would have been necessary to connect new coal power plants in Northern Germany to demand centres in the South. Decomissioning costs have the tendency to be larger than expected. For example current cost estimates for cleaning up the oldest british nuclear power plants are already twice the estimates of ten years ago. Experts already think that the reserves for decommissioning Hinkley point C are too small. In the end the difference will be socialised. On the Suedlink – ‘wind power link’ as described on Tennet’s website, estimated costs are around 15bn Euros. HPC has a raft of agreements in place with the Government to cover the decommissioning costs. The project should be very profitable so I wouldn’t worry about any costs falling on the tax payer. PWRs are not difficult to decommission unlike the UKs legacy gas cooled reactors. More uncertain is the cost of the final repository for spent fuel which the UK Government needs to build. HPC will pay for storage space. Repository development is advanced in Scandinavia in terms of estimating costs in the UK. If there is no support for Wind and solar, the only interesting point is grid expansion and the amount of time it will take to move power generation to wind and solar also in countries like the netherlands as long as there is no technical revolution in the power generation with coal and gas. With power prices in auctions at 5,66ct/kWh for solar power and 5,71ct/kWh for onshore wind in germany, which are surely reachable in the netherlands too, prices are below the market prices whch german utilities tell that they are requied as sales prices to recover investment for new conventional poer plants, which are roughly at 6ct/kWh for lignite power plants, 8ct/kWh for hard coal plants and 11ct/kWh for gas power plants. Since power plants do not last forever, at some time existing power plants will leave the market, and each of them will cause a little rise in market prices. What remains a interesting point is the time of production and the pirce of the amrket at this point. With a ideal grid, a world wide cost free copperplate, the time of power production of local solar and wind would not matter, there would always be a practically constant demand sucking up the local production easily without significant price changes, and with an constant overall solar and wind production in this grid as well, keeping prices constant. In the other extreme, no grid at all, and zero flexibility of demand, prices for solar and wind power would drop to zero limiting economics of wind and solar power production, over the thumb solar to something like twice noon demand, and wind to something like kwice average demand or so. Real world is somewhere in between. When we look at the netherlands, without the lignite option, there is a headwayof about 2,5ct/kWh for the average power sales price before new coal power plants would be built due to economics. which would leave roughly 2,5ct/kWh to transport power from areas of oversupply to areas of low supply, or to incentive demand management, or storages, which would extend the reasonable share of wind and solar above the local no grid model. The 2,5 ct/kWh seem to be in the right ballpark to allow transportation distances for wind power to make it a roughly constant power source. Which would eliminate the business case for coal power plants unless something reduces the cost for coal power plats from the figures I have so far. For solar it would allow to smooth out cludy/non cloudy areas by grid. And the 5ct/kWh price difference towards Gas (peakers) might be enough to finance storages within the grid which would shape power output of solar towards the day peak at least during the summer half of year. Remains the day peak in the winter half of year. MENA region is likely to have a solar power surplus at exactly this time. 5ct/kWh might be enough to finance the grid extensions to make use of this. So todays prices for wind and solar are roughly at the level where they would slowly bus surely eliminate coal and gas from the grid when the prices remain as they are now, and if the prices I have are correct. But this would happen much too slow for the climate. So politics needs to push this process to accelerate it. It would change the game when tenders go below short time variable costs or medium time variable costs of power plants, because this would allow to push existing coal and gas plants from the market prematurely. This could already work up to a renewables share which is economical without any significant grid transportation. Todays power market prices in germany causes premature closures of older power plants as soon as some investment for repairs or adoptions to regulations are neccesary. Which means these prices are nut sustainable with coal and gas power plants. Which means market prices will rise as soon as wind and solar power additions would become smaller. Prices for wind and solar ar at a turning point, where each small reduction of power production prices increase the shar whichthey can reach at the merket without support rises a lot. At some point this will induce negative economy of scale for their competiors, so gas and coal powered plants, which will rise prices of operation for conventional power. At this point the system will tilt from fossil fuel to renewables. Looks like we might approach this point already, because a lot of production sites for equipment for coal and gas power plants are closing. And as far as scaling up production is concerned, there are no problems, neither for wind and especially not solar. E.g. existing projects for polysilicon production and the ongoing switch from wire sawing with silicon carbide to diamond wire saw, which drops silicon use from 5g/W to about 3,5g/W till 2020 allowes to increase solar module output to about 200GW/year in 2020. Same diamond wire saws technology allows retrofitting existing saws to new technlogy, allowing to saw more wafers in a shorter time with the same machine, over the thumb nearly doubeling wafer capacitys without a single new machine. leaves cell manufacturing, where the switch to PERC /PERT processes is ongoing, which allowes higher efficiency with a less or same complex process. Not so much change than in the wafer area, but there are also a lot of ongoing factory extensions worldwide. Which means production capacity will be there, remaining question will be how much can be sold. New huge rooftop solar (industrial roofs) and open field solar in germany is just below 700€/kWp today as I was told by those who build the systems. Tendency falling. If german prices can be realised elsewhere too, this should allow to sell a lot of panels in desert regions. Solar installers in germany complain that their books are full till the end of the year, but they can not get qualified workers to build more – limiting solar growth at the moment. Margins are not (yet) high enough again to attract more workers, or to train workers from completely different areas. Which might stop the price drop of siystems and rise margins of solar installers, which would be a healthy development if installation rate keeps rising (but not exploding). Meanwhile, in the real world we see that Germany maintains a parallel fleet of conventional plants able to fully supply Germany’s electricity demand so taking zero risk with renewables intermittency. Sovereign nations are not going to play roulette either and rely on renewables flung far and wide outside of their control and uncertain in delivery over great transmission distances. The required grid system being too costly, politically too difficult to deliver and essentially not needed as any sensible national Government will do as Germany does and maintain enough conventional capacity too. In terms of contribution to energy consumed, the hard facts are wind power is essentially constrained by CF which is <40%, and solar even worse in northern Europe at around 10%. Storage in Europe on the scale needed to push renewables share of energy consumption above those limits would be huge amounting to many TWhs which is not practical and would entail huge cost. The future is certainly more renewables but a mix of energy sources will prevail, not exclusively renewables. “the hard facts are wind power is essentially constrained by CF which is <40%"
Sorry. Most new wind farms in the US are now reporting CFs in excess of 40% with several above 50%. The DOE recently identified 2 million km2 of usable land where we can achieve CFs of 60% and higher by using 140 meter hub heights and modern turbine technology. I'd be very careful about making assumptions regarding wind if you don't have data for 140 meters or higher. Solar may not be a big player in northern Europe. But northern Europe has enough offshore wind to power the entire continent and a lot of the rest of the world as well. Nigel, having backup, and the mix of energy actually in use ae two totally different things. That we like to have enough backup for worst case scenarios in germany: correct. but they operate correct when they are never ever used. That’s what backup is made for: not to be used. The actual power can come from 100% renewables and be transported over long distances. The grid costs are not low, but the falling prices of renewables allow to finance it, because other modes of opwer generation is also not free of costs. Remember the cour de comptes calculated 6,5ct/kWh to keep the existing nuclear power fleet of france online (by the way, at the moment more than 20 nuclear power staions in france are of or with reduced output) which is above the prces for new onshore wind, solar, or offshore wind in germany. So this already leaves some financial room in comparison to finance grid extensions. Every fraction of a cent which renewable power prices come down further expands this financial headroom. Which explains why E.ON changed sides in the game, and Shell seems to have been climbing up half way on the fence, just in case… I would not say they sit on the fence already, but they are also not firmly on the other side of the fence any more. I remember the energy minister of Botswana ruled out any renewable power there for a very long future, because botswana has abundant cheap coal reserves to pweor the country for many centuries. Well today botswana does not intend to build further state owned coal power stations, but allows companies to build as mechant plants what was planned as state owned coal power plants before. Instead they started the first 100MW of solar power, to be extended further. Solar ressources of botswana by far exceede coal resources, and costs are lower too. Money makes people flexible, even energy ministers. Luckily the US is not a monolithic block. Many US states are committed to fighting climate change. Even some Republican ruled states see the benefits of renewables. Luckily the US is a country of rugged individualists. Many US citizens hate to be dependent on the whims of a for-profit monopolistic utility and will take their electricity supply in their own hands as soon as they can afford it. Luckily Trump is good as selling baked air. Like the arms-deal mentioned in the article. It is just a vague expression of intent by the Saudis. Nothing solid. All this does not mean there is nothing to worry about. But it does mean that the situation is not hopeless and there are many ways to fight the negative changes planned by Trump and to keep the (bio-gas) fueled flame alive until the US voters get some sense in their head again. Trump’s impact will likely be to cut research and development in the US. His Secretary of Energy is in the process of doing that. Research money is being pulled from federal agencies at this very moment. What Trump won’t do is to make an appreciable cut in the amount of wind, solar, and storage that is installed in the US. Prices have become so low that even the most conservative parts of the nation are switching from traditional generation to renewables. We just saw a new contract in Arizona, one of our most conservative states, for dispatchable solar for roughly $0.11/kWh. The overall contract provides both solar-direct for about $0.04/kWh which can be used for daytime use and stores a portion of the production for use after the Sun sets at $0.11/kWh. The vast majority of our wind farms are in conservative, Republican states. Money speaks and money drives decisions. Trump can’t mess with the economics of the renewable energy we are now installing. @ Nigel West: you are aware that there is a significan punishmnt in case a offshore windfarm is not being built? And the power connection of hinkley point is also socialised, it’s a seperate project of national grid. Nothing special here. No, that’s not correct. Only the system reinforcement costs are absorbed by National Grid and charged to consumers. Because the Hinkley Point site is already served by a Grid substation the dedicated connection for HPC is very short and paid for by HPC. UK off shore wind projects have to fund their much longer connection to the onshore National Grid system. Whereas in Germany the connection cost from shore to off-shore platform substation is socialised so making off shore wind look cheaper compared to the UK where there are not hidden costs. I can not see any difference between switchgears and power lines being built parallel to existing ones being socialised, and switchgears and power lines not being built parallel to existing ones being socialised. It#s the same procedure for offshore wind power now than it would be for a new coal power site in germany now too. The grid opwerator builds or extends a substation nearby, and the rest is business of the one building the power station. The only “new” thing is that in UK as it seems a substation at the coastline is seen as “near” even if it is many km away from the power station, while in germany near means near, no matter if the surrounding area il land or water. Fo me it looks as if UKtreats onshore and offshore power generation differently, without obvious cause. 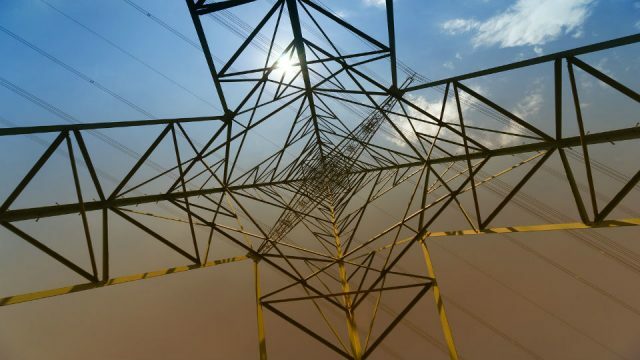 If investors choose to build a generator of any type 100s km from demand centres, rather than close to existing transmission infrastructure, consumers should not have to foot the bill for their long grid connection through elevated grid charges. One question I ask myself now, some days after reading: what is the power of the “Petro block”, beside military power, if the rest decides to use other power sources than petrol and gas. There is no much use if US, Russia and Saudi arabia sell each other oil and gas. And the power which lies in oil and gas is the possibility to deny delivery to others. Which is useless when the other does not want and need it. So the root of such a block vanishes with every car battery manufactuerd, with every wind turbine or solar module installed. So how should trump hinder e.g. china to install wind and solar power in china, or to manufacture car batteries in china? Little options come to my mind, non of them realistic. First, remember that Trump is an extremely ineffective president. To date Trump has accomplished essentially nothing. He has signed a lot of pieces of paper some of which have no meaning and others which have been largely ignored. The US isn’t going to stop or slow the development of renewables in other countries. Installation may be slower than it would been in some less economically able countries because a liberal president (and Congress) would likely have assisted less developed countries, which the current government almost certainly will not do. I can’t see petroleum being withheld from the market in a way that would slow renewables. Just the opposite. I think most oil producing countries now see the upcoming demand drop for petroleum and will be eager to sell as much as they can prior to the market collapse which will greatly lower prices for oil and profits for oil producers. One source I find says that Russia’s oil production cost is above $20/barrel. Five years into the era of affordable long-range EVs (between 2022 and 2025) we could see Russia starting to be priced out of the oil market. Much of US production will have already been ended. Saudi Arabia, Iran, and Iraq could be supplying the market with $20 oil in order to build up their capital while they can still get $20. The remaining oil suppliers would not be able to threaten other countries like Russia and the US because if supply was withheld shutdown wells could be brought back online. All that would happen is the cost of oil would rise to no higher than $50/barrel. “if you keep installing wind and solar at such high rates we will sell you petroleum at half price or cheaper” ? Doesn’t make much sense. Withholding petroleum also would just accelerate transition to renewables. So the petroleum block can push things just in the “wrong” direction from the petroleum sales view. Remain massive fake news propaganda, and trying to influce elections, beside militrary options. Military action in the Middle East, anything that heavily involved Saudi Arabia, Iran, or Iraq would likely restrict oil flow from the least expensive producers, drive up the cost of oil, and accelerate the movement to EVs and other battery powered vehicles (buses, trucks, etc. ).